Do you want to combine multiple MPEG videos files into a single video file?” PaM MPEGJoint” is a free portable utility for quick joining of multiple MPEG video files. Just add video files in the utility window to get final combined or merged video file (works with only MPEG format of videos). 1. 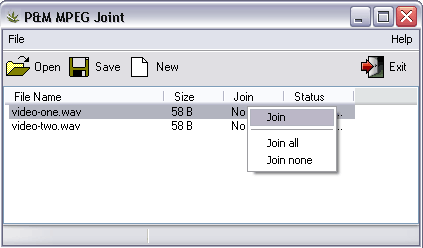 Download PaM MPEGJoint & unzip downloaded file. 2. Double click application icon to launch the program. 3. Goto File > Open to add multiple MPEG videos files. 4. Right click one each added file & select join option. 5. Goto File > Save to get single merged video file.